I specialize in birth, fresh 48, newborn, maternity, child and family photography in 30a, the Florida Panhandle and the Wiregrass area. My style is a mixture of classical portraiture and lifestyle portraiture. I aim to deliver images that are timeless, natural and evoke emotion. My life has been filled with adventures, some planned and some spontaneous. I like to create a gallery filled with a collection of images ranging from the small details of toes, eyelashes, and a mother or fathers arms holding their child to the casual posed images of a family to the images of children laughing, mom and dad running after their little ones, or brother and sister sharing their joy with each other. I am blessed when a client chooses me to be their photographer, and I pour my heart into each session. I have been a photographer for 4 years. I hand edit each image delivering the quality that you expect. I am an on location and a studio photographer. I offer a range of sessions to fit each of my clients. 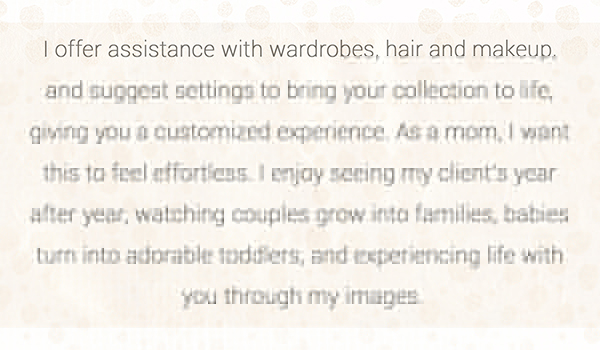 Take a peak at my portfolio , and let me know when you would like to schedule your session with me. Kerrie Brogdon of Kerrie B Photography is a 30a, Florida Panhandle and Wiregrass Region professional photographer. Specializing in baby, maternity, child and family photography.